Have you ever considered sowing seeds outdoors during the winter, in snow and sub-zero temperatures? Winter sowing sounds too good to be true, but sowing seeds in winter is actually a very old technique. Many seeds even sow themselves in winter. Starting them in enclosed containers simply gets them going a bit sooner in the spring. You can help things along with some winter sowing tips. Who Thought up Winter Sowing? The phrase Winter Sowing is attributed to Trudi Davidoff, a resourceful gardener who had more seeds than indoor space. Ms. Davidoff sows seeds in covered containers and then moves the containers outdoors. The containers act as mini greenhouses, allowing the seeds to experience the chill of winter in a controlled environment. When the temperature warms enough, the seeds germinate and start to grow on their own. By the time the soil in the planting beds has warmed, the seedlings are ready to transplant out. This may all sound like common sense, but we can thank Ms. Davidoff for reminding us and calling it to our attention. The concept has caught on, thanks in part to her website WinterSown.org, and in 2006 the USDA recognized the viability of the technique by adding the term to the National Agricultural Library Thesaurus. Over the years, Davidoff has refined the technique and offers many tips on the likes and dislikes of specific plants. However, sowing seeds in the fall or winter is an old technique used worldwide. You may have tried it yourself, in the vegetable garden, sowing spinach and corn salad (mache) in the late fall for harvesting soon after the snow melts. The seed lies dormant all winter and is ready to sprout the first chance it gets, in the spring. Any gardener who has ever cursed an effusive self-seeding plant knows that some seeds do very, very well when left outside in the cold all winter. You may even get a better germination rate than you would if you were starting the same seeds indoors. 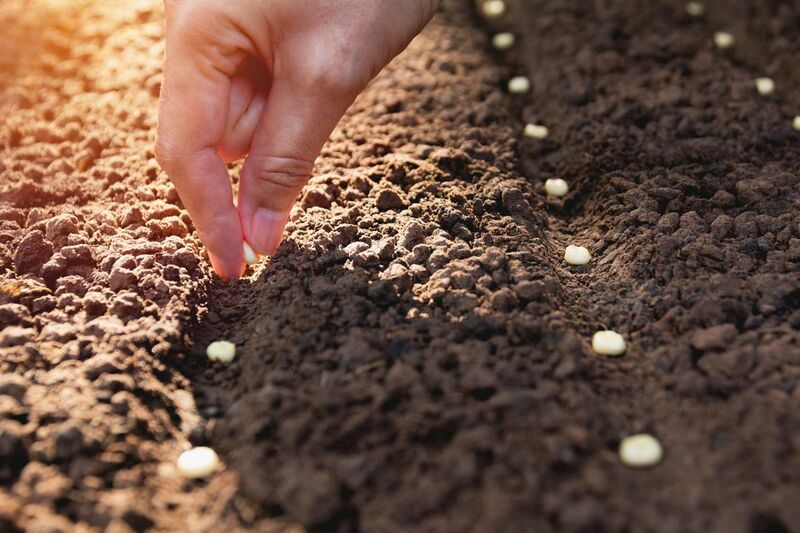 There are seeds that need to experience cold, damp conditions either because they have hard shells that are softened by the freezing and thawing or because they are triggered by the change in temperature to sprout. This is called stratification. Sometimes certain seed packets, for instance, parsley, will tell you to place your seeds in the freezer for a few weeks, for quicker germination. The reason for this is to simulate stratification. You can make it even easier by simply winter sowing your parsley seed. You can either direct seed or start seed in containers, to be transplanted later. Direct sowing will not give you as much of a head start as sowing in containers because the soil in the ground will not warm up as fast as the soil in the plastic container. However, it will save you the time and effort of transplanting. If using containers, be sure to use a container that can handle the freezing and thawing caused by winter weather. Make sure you have drainage holes at the bottom of the container and air vents in the top covering. Keep the vents small, to begin with, and widen them as the weather warms in spring. The site "Container Gardening for You" has a great step-by-step using open water jugs. Use at least 2–3 inches of potting mix, preferably 3–5 inches. This will help insulate the seeds and prevent them from being heaved to the surface. Sow more seeds than you think you'll need. Germination rates will be lower than if grown in ideal conditions. However don't sow too thickly or the seedlings will crowd each other out when they begin to grow. Label your containers. You think you will remember, but chances are good you will not. Many self-seeders can be sown in the fall, for early spring germination or in very early spring, for a later bloom. Starting your seeds at staggered times will give you a longer season growing season. Expect to lose a few, but be warned that Winter Sowing is addictive.